Sara Mansour is the Co-Founder, Artistic Director and Host of the Bankstown Poetry Slam. Create NSW sat down with Sara to talk about this year’s event. 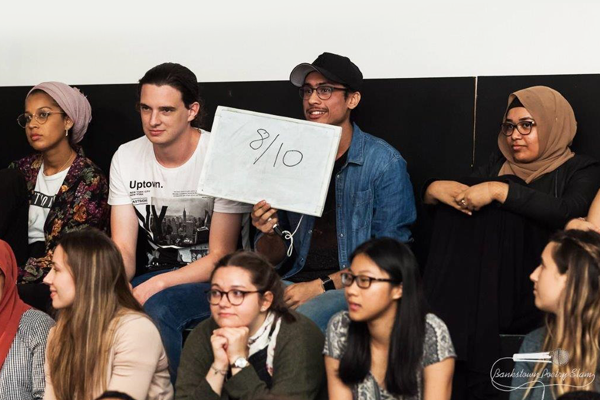 What impact have you seen the Bankstown Poetry Slam have on the Western Sydney community since it began in 2013? The biggest impact can be seen in terms of the engagement of the Western Sydney community with the arts. Bankstown Poetry Slam was not only the first regular poetry slam to take place in Western Sydney, but it is also the largest in the country, regularly attracting between 200-300 people every month. People from our community feel that they have a safe space that they can regularly return to, to share their poetry, to vent, and to validate their lived experiences. Organisations like Bankstown Poetry Slam have not only engaged young people, but also bolstered the artistic capacity of the region. We have nurtured hundreds of poets over the last 5 years, and seen them grow from first time performers to international successes. It is because of BPS and other arts organisations in the region that many people look at Western Sydney through a different lens and start to breach gaps of misunderstanding with olive branches of awareness and respect. How has the Bankstown Poetry Slam evolved in recent years? In recent years, Bankstown Poetry Slam has collaborated extensively with festivals, arts organisations and other entities. We are finding that there is an increased appreciation for spoken word poetry, especially in non-arts circles, and people really value the live element of performance poetry. Every year we have been trying to build on the successes of the previous year by curating more events and programs, like Hakayet: a storytelling evening or Write Here, Write Now a spoken-word based theatre show. We do this in response to the growing need for our patrons to access more spoken word poetry based arts events. Bankstown Poetry Slam has won a large number of awards, including; ZEST Award for best project promoting social cohesion and Pemulway Prize 2016. Has this impacted the collective? I think that recognition is really important in any practice, but I feel that this is especially so in the arts space where you really pour everything into your work in the hope that it helps others and affects real change. The recognition, through the form of awards, positive reviews and even just general community support sends a positive message to the collective, who all volunteer their time to make it happen. It says to them: keep going. Why do you think poetry is a useful way to engage young people? I think poetry for people of any age is a really cathartic and accessible way to dissect issues and deal with them. Writing has been proven to be really helpful to those dealing with trauma, and we all have a creative side that is itching to be explored. With respect to young people, I think poetry is a great tool that can be used to help them address whatever it is that they need to address. Spoken word poetry takes the writing to the next step as you have the opportunity to perform your words and engage with the audience on a really personal level. In turn, the audience clicks and validates the performer and their experiences, and it feels very supportive. This is one of the main reasons I was attracted to spoken word poetry six years ago as a late teen – it seemed like a really great way to finally speak for myself and to feel ‘heard’. As leaders of your community what do you think are the major barriers to engaging young people? Engaging young people is a hard gig if they don’t want to be engaged. However, an effective way to engage young people is to get other young people on board, and to really get them involved by giving them responsibilities and the space to take ownership of their work. Other barriers practically speaking can include cost of events, transport and access. We try to ensure that all of our events are accessible and close to transport. Further, over 90% of our events are free. We want to support young people to continue to come into our spaces and sometimes that $5 entry fee is someone’s lunch. I remember when I was young and unemployed. Bankstown Poetry Slam gives people a voice, what do you think can been done across the arts and cultural sector to help increase opportunities for people from diverse backgrounds? I think that having policies in place that look beyond quotas and seek to actively engage a range of skilled people from diverse backgrounds is really important. This will, in turn, hopefully engage more diverse participation in arts events. I would like to see organisations that have the resources and funding take an active role in nurturing and empowering artists from diverse backgrounds through mentoring programs and professional development programs. It is only through collaboration and support that we can really level the playing field and ensure that people from diverse backgrounds are getting the space that they need to practise their art.